Wooded - situated on scenic central campus hill. Not well marked. 1st hole plays up to the Recitation hall on the left. You then play up to the right of the big red bldg. at the top of the hill. I-70 to Rt. 40W (exit 62), follow into town about 7 miles, right on Fountain Ave., left at 3rd light (Ward St.), through 4-way stop, park on street, 1st tee and 9th hole at entrance fountain. The course I learned on, and still nearly my favorite after playing dozens in several states. It fits perfectly in the category of "park-like course with old trees" and as such it will feel wide open if you're used to woods and technical if you're used to fields. 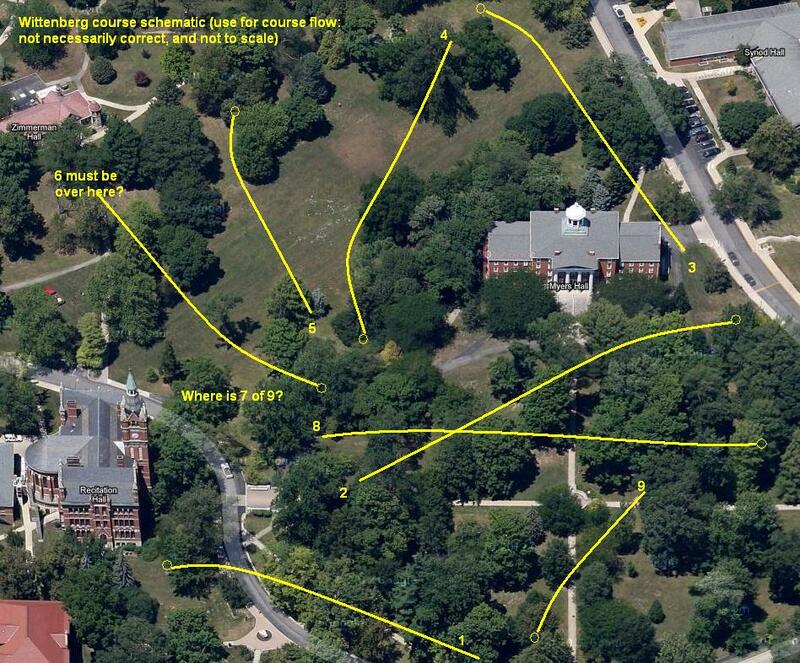 The course snakes around the hilltop campus of small Wittenberg University in Springfield (not too many co-ed obstacles, but enough to be friendly). The campus is known as a fairly nice arboretum, and the grounds are obsessively maintained. Though I almost exclusively seek out 18-hole courses, I frequently forget this only 9. It was designed well with a balance of right, left, long, short, etc. shots needed. All holes play up, down, or across rolling slopes of varying degree. No hole is very similar to any other; each presents a unique challenge, and nearly all present a choice of attacks. The lack of "rough" or "jungle" makes it a great place to introduce people to the sport. The downside: tho the course is locally well-known and fairly tight with no long walks, there are no permanent tees or signs apart from worn patches in the grass. You WILL need to follow someone or jump in with a local player the first time around, as the next tee is often not obvious or hard to spot. This also means footing can be a problem when teeing off, and is on several holes not quite level. As of summer 2010 and from my knowledge of the local pros, the record is probably 4-under, playing all as par 3. A perfect round, with no aces or so-called fairway aces, is 6-under as 3 (maybe 2) are unreachable with one drive.